Y’all, I am SO thrilled to introduce you to my dear friend, Marlena Graves!! 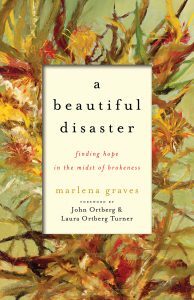 Marlena has just written her first book, A Beautiful Disaster: Finding Hope in the Midst of Brokenness, and it is a Christ-centered look at our journeys through the wilderness. I’ve been reading it as I walk through my own season of wilderness, and it’s been a perfect mix of godly comfort and chastening truth. 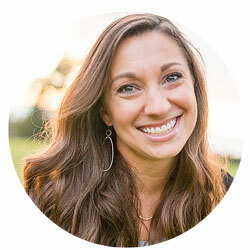 As for Marlena herself, she is a wife, mom, and a fellow contributor to Her.meneutics and Gifted for Leadership. There are so many things I treasure about Marlena, but one of the things I love most about her is that she sees people. In the writing world it’s easy to feel like other writers are constantly sizing you up or ignoring you if you’re not important enough. In that world, Marlena is a city on a hill. She is gifted at making people feel seen, valued, and loved. And her thoughtful, loving character–as well as the influence Dallas Willard has had on her life–shines through her writing. She is the real deal, folks. Whether consciously or subconsciously, many of us spend our time searching for our identities. Others of us are desperately seeking to shed them in favor of becoming someone else. “Who am I?”, “Who can I become?”, and “Where do I belong?” are the questions that claw at us, motivating much of our behavior. Amazingly, God often chooses to reveal who we are in the midst of suffering. It may come as a shock to us; after all, desert experiences are probably the last places we’d think to look in order to discover our God-given identities. Indeed, it seems incredibly strange that God would reveal our identities and his own in the crucible of pain. But he does. For some of us, an identity crisis comes on suddenly, something triggers it. Others of us have been saddled with an identity crisis our entire lives. We’ve accepted identities that others foisted upon us in their ignorance or exasperation or in the throes of their own suffering. Interestingly enough, even seemingly “nice” Christian people deform us by carelessly tossing out names for us. And because we are vulnerable, tender shoots, we often grow into these clueless, careless estimations of ourselves instead of accepting God’s Word to us and about us. Maybe we don’t believe God thinks much of us anyhow. In our twisted and hurting states, in our search for ourselves, for our identities, we often butcher our own names because we’ve accepted what others or our environment says about us. As a result, we assume aliases that deform us. Our aliases morph into pigeonholes we can’t crawl out of, labels we can’t escape—self-fulfilling prophecies. We do things we’d never imagine doing when we are in our right minds—things like I did. Not only do we have to confess our unholy names (sins and unholy bents and dispositions) to God, but we also need to confess our false names and identities to trusted others within the beloved community for transformation to happen. As James 5:16 tells us, healing comes when we come clean with one another and pray for one another. One look at ourselves in the divine mirror and we’re horrified—horrified because for the first time we realize our true condition. We discover that we’re guilty of hideous, deeply ingrained sins we were too self-righteous to see before, sins we quickly identified in others but were blind to in ourselves. And even when we recognize our sins, we find that we more readily excuse in ourselves what we despise in others. That is, we cut ourselves the slack we refuse to cut others. It is only in coming face-to-face with God and our self-illusions that we are ultimately stripped of those illusions and false identities. That is purification. It doesn’t happen in an instant but little by little throughout our lives as our hearts are transformed to look like Jesus’s heart. Seriously, this is great stuff. For the Christian who earnestly desires to grow in God, who does not want their pain to go in vain, this is the book for you. Marlena’s book releases June 10th, and I am so pleased to offer you a chance at two of the very first copies. Leave a comment about how your own seasons of wilderness have shaped your identity, and I’ll enter your name into a drawing for a free copy. And join me next week for my next book giveaway, Team US: Marriage Together by Ashleigh Slater! What a beautiful excerpt. This sounds like a book I need to read. Just last night I was reflecting on a very painful season of my life. Even the aftermath has been difficult as I begin to shed labels and identities that others have placed on me. It is scary letting go of things I always thought I was in order to embrace where I believe God is leading me. Even this excerpt has given me great thoughts for processing through that wilderness time. Thanks! it is great to know there is encouragement by how God deals with us in different ways. In this season of wilderness that my family is in – I’m learning that I’m more of a creative than I thought! That is a great thing! I feel so much like the Israelites in the desert right now. I was definitely, miraculously- rescued out of slavery in Egypt (my slavery being a marriage that was painfully abusive). Now God provides for me one day at a time. I struggle to stay aware of how lucky I am. I struggle just like the Israelites did. I need to be lead just like the Israelites did. My prayer is to rely on the Holy Spirit, not my self. Thank you for this blog! Great excerpt. I especially like what Marlena said about how, if we’re not careful, we can become “clueless, careless estimations of ourselves instead of accepting God’s Word to us and about us.” In my wilderness, I believed that Jesus cherished all people and willingly died for them, but I thought he loved me begrudgingly, because he knows what I’m REALLY like. When I finally stopped being prideful and asking God to help me know the way he loved him, I was finally released from that area of spiritual wilderness. Maybe we are always in some form of wilderness in our life, even if it’s not all-consuming. There are always blind spots. I am having to come to grips with the fact I am not in control, this coming from a control freak. My adult son is becoming rebellious and it has a lot to do with me wanting to be in control. I’ve had control issues my whole life. My mom says even as a Kindergartener I told the Principal what to do…oh no she didn’t. I’m afraid I did. Finally in my middle ages I am learning to let God be in control. He can do a better job than I can and I really don’t want His job. A couple of years ago I lost the sense of the Lord’s presence. It was deeply frightening and truly desert-like. I ached for Him to speak, to feel Him close, anything. I finally got so frustrated that I said to Him, out loud, “Fine. I’ll just sit here on this rock next to this cactus until You decide to come by.” (I’m a visual person). Much to my surprise, that sitting turned out to be exactly what He wanted from me. And now I am in another wilderness, another time of sitting, as chronic illness forces me to step back and reevaluate how I’m spending my time and where I’m supposed to be serving. Thank you for sharing this book, Sharon. Even if I don’t win the giveaway, I’ll definitely be reading it. I am just starting to catch a glimpse of silver lining. This has been a desert stretching into five years. I would love to read this book. Thank you Sharon, and to you all for sharing about your wilderness experiences. No experience is exactly the same. And sometimes it’s hard to imagine God is closest in the midst of our different sufferings. It is important to have wilderness companions to sit with us and encourage us. I am not talking about people that will make things worse by being around – like Job’s friends. I look forward to continued conversation with you. I do pray that you will meet God right here, right where you are. And the winners are….Michelle and Kim!!! Thanks to everyone who commented and shared–I hope you will check out Marlena’s book and be encouraged by it!